London Heathrow is the UK’s largest international airport and gateway to the southeast of England. Reserve your recreational vehicle (RV) rental online before you travel, and pick up the keys from your London Heathrow Airport motorhome rental, campervan and recreational vehicle hire agent. Alternatively, you can choose to spend a couple of days in London city – one of the most vibrant European cities – before picking up your RV hire, campervan or motorhome rental branch. London is a very old city, brimming with culture and history stretching back through the ages. There are a wealth of museums and galleries to explore. You can see a show at London’s famous West End, take a spin in the London Eye, or visit one of the many cultural and historical buildings, such as the Tower of London, London Bridge, and Big Ben at Westminster Parliament. If visiting the city, it would be a good idea to park at a campground outside the city; before travelling in by the underground or local train. The advantage of a self-drive camping holiday or vacation in a motorhome rental, campervan hire or RV rentals in the United Kingdom is that you are calling all the shots, guaranteeing you a relaxed trip totally at your own pace. There are holiday parks and caravan and camping sites that will accept motorhomes, campervans and recreational vehicles with truly amazing locations and facilities in the countryside surrounding London. There is something very unique and special about the British countryside that is good for the soul. Explore nature trails and talk to the cows on country lanes. Stop in quaint country towns to enjoy a pint of bitter and get to know some locals at a cosy pub. There are cultural and heritage sites scattered across the land. South of the city is the well-known Brighton, a seaside town and popular destination for locals as well as international visitors. It is a lively and quirky town with a thriving cultural center of arts and theatre. 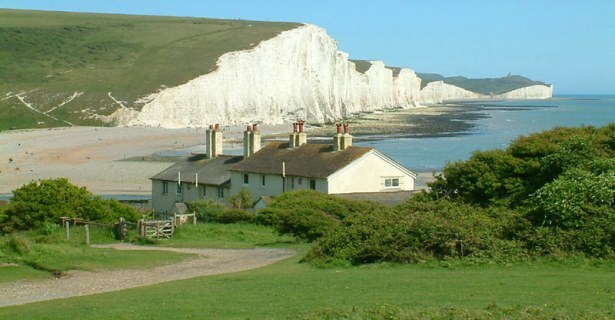 Drive along the coast to visit the port town of Newhaven leading into the county of Sussex and the Seven Sisters cliffs. Make your way through this old Saxon countryside back to London city, leave your RV rentals at your London Heathrow Airport motorhome rental and campervan hire depot. Leave feeling relaxed and rejuvenated.